Today’s post is an essay about the events of this past week that have given me pause for reflection. Many thanks to Marla (@bluemarla) for permission to publish her photo. Last week, I learned a new word: haboob—a violent, summer sandstorm—thanks to the powerful images of Phoenix photographer Mike Olbinski. This week, I learned another meteorological term: derecho. The northern Chicago suburbs were hit hard on Monday by a violent derecho: an intense, widespread, fast-moving windstorm that produces damaging straight-line winds. Monday’s event caught my full attention. My wife and children were staying in Chicago’s northern suburbs when the storm hit. Thankfully, my family is safe. But in the storm’s wake, my wife and kids had to endure 76 hours without electricity, detour around downed power lines and trees, and cope with long lines at the gas station, reminiscent of the ‘70s oil embargo (those of you old enough to remember :)). As the week’s events unfolded, my emotions ran the gamut: concern, frustration, anger, and powerless—yet I didn’t feel disconnected. Despite their power loss, my family and I sporadically talked via cell phone. I began to feel empowered, while sitting in front of my Mac pulling up current weather conditions, road closures, and latest bulletins from the local municipal websites. I created a sort of in-home command center that enabled me to feed important updates to my wife. To my surprise, Twitter became indispensable. I became glued to it, following Commonwealth Edison (@ComEd), Illinois’ largest electric utility. At this very moment, ComEd continues to feed news to customers 24/7 during this unprecedented state of emergency. A real-time tool, serving thousands in ways that a call center or website couldn’t possible keep pace—yet alone allow you to connect, if you don’t have power. Any battery-powered portable smart device serves up Twitter. Granted, this media has limitations: specific questions I asked weren’t addressed; some answers were highly scripted and impersonal. Yet the exchanges between ComEd and Twitter followers were largely supportive and civilized. More importantly, Twitter took on a living, breathing presence. Followers, whose power was restored, would hash tag: #ComEdRestored. By searching this tag, customers—even ComEd—could form an accurate, real-time picture of towns whose power had been restored. Now that’s pretty amazing! So what have I learned? Social media can be a powerful communication vehicle. It doesn’t require specialized knowledge or training. It is decentralized and not beholden to one authoritative voice. It’s remarkably helpful, particularly during times of crisis. It’s predicated on social interaction that’s accessible, immediate, and relevant. But it can’t replace the voice of my kids, “We love you daddy and miss you.” Now that’s priceless. Fantastic post and essay Chris. It is amazing how technology we have become addicted to can also serve to ease our minds and hear those important sounds or see those important views we need to hear and see. Glad your family is OK. I often wonder what would happen to our lives if we lost electricity. It’s one of those things that’s become a necessity in our modern lives and things can go rather badly without it. First and foremost, I am thrilled to hear that you and your family are OK, Chris. I had no idea this storm had hit your area. I used to be a bit of a “Negative Nelly” when it came to social media, before we signed up and got fully intertwined into the community. Now I see it as a completely important and necessary thing. Your essay today really drives home one example of why. Wonderful post today, Chris, and like I said, I am so happy to hear all is well with you and your family. Best wishes. Thanks, Toad and Jim for your thoughtful comments and well-wishes. The on-going and heroic efforts of ComEd should be noted. In the wake of the storm, over 800,000 ComEd customers were left in the dark. 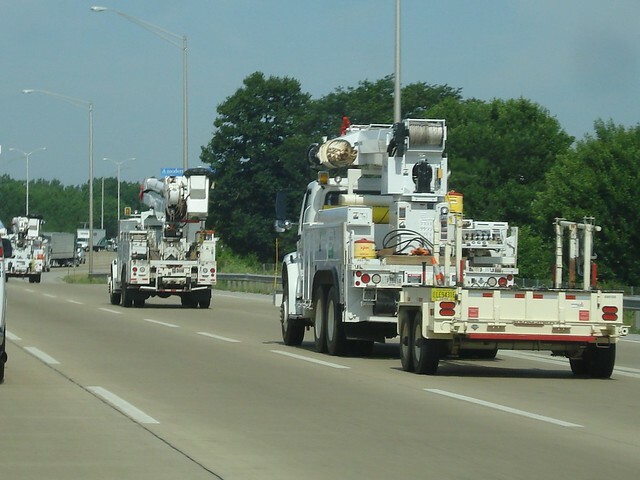 Over the past 4-1/2 days, more than 800 technicians from IL as well as AL, FL, GA, IN, KS, MI, MN, MO, OH, PA, WI, & TN have assisted in the restoration efforts, working 16 hr. shifts. At the time of this comment, about 98% of customers have power resorted. Also, I have to agree with you on how useful social tools are. Not only do they enrich our relationships with other professionals, and give us access to information that we could never have accessed previously, but I think that examples like the one you cite are more common than people think. I remember hearing a Marine talk about how he spends much more time with his family due to social tools that let him communicate with his family in real time, almost all the time. Nice post – glad all is well. I agree that Twitter is indispensable in a crisis situation. although there are not that many of my friends that use it I often urge them to do so as it gives up to the minute information. I was glued to it when the riots licked off here last month and was therefore prepared on my may to work the following day.